Personnel from the Grupo Vidanta hotels, the Grand Occidental, Royal Decameron and Iberostar Playa Mita completed Coefficient Project workshops. As part of the Community Leadership Program (PLAC by its acronym in Spanish) established by the Federal Environmental Protection Agency (Profepa) the Monterrey Tech Institute offered a Coefficient Project workshop to hotels and businesses in Nayarit to help them identify environmental efficiency opportunities that result in energy and monetary savings. The training ended with a closing ceremony on Friday, November 4th, during which the Riviera Nayarit hotel personnel who had completed the course presented the environmental projects they were proposing to their respective businesses. Statistics indicate that 70% of these proposals are accepted. Personnel from Grupo Vidanta presented an eco-efficiency project that included a change of water heaters. The group from the Grand Occidental focused on an opportunity in the management of PET, which seeks to reduce solid waste to a minimum by decreasing the use of plastic water bottles. Staff from the Royal Decameron proposed switching out their air conditioning equipment and lighting and offering more training to their personnel. Other businesses and organizations also partook of the training, including the Bahía de Banderas Tourism Trust (FIBBA), the Bahía de Banderas Technological Institute, the Nayarit Autonomous University and the Iberostar Playa Mita Hotel. During the event the Profepa awarded environmental certificates to businesses that already voluntarily undergone an environmental audit, thus avoiding fines and taking the first step in answering the global call for businesses to focus on protecting the environment. 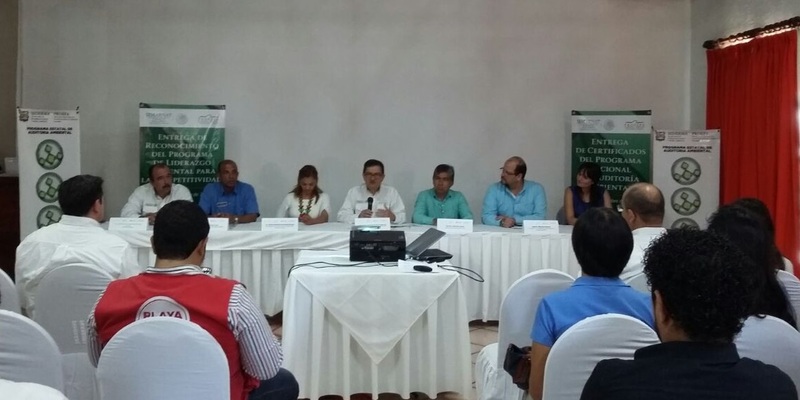 It should be noted that in May 2016, before Nuevo Vallarta received the environmental certificate as a “Clean Tourism Destination,” the Bahía de Banderas Hotel and Motel Association had presented a letter of intent to Rafael Pacchiano Alamán, the Secretary of Environment and Natural Resources, stating an interest in promoting and encouraging the participation of its members in the different federal environmental programs.